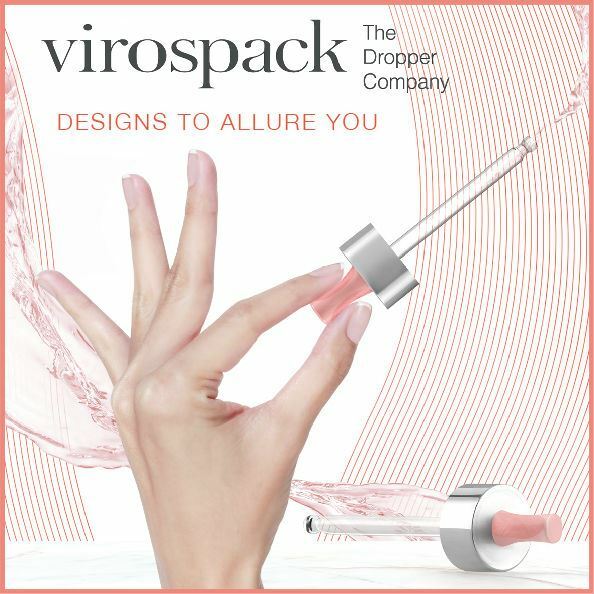 Virospack's new cosmetic dropper benefits from an innovative bulb design that combines style and functionality with ergonomics. The dropper features more stylized lines and a taller bulb design with a special curvature in the centre which indicates the best area to action for the in-take of the product. Virospack has highlighted the product's innovative curvy design with a textured, non-slip fingerprint-like effect decoration: An innovative finish developed by the company through 3D technology that enables decoration at different depths to achieve a micro relief effect. The result is a dropper finish that is striking and pleasing to the touch, which has been incorporated into Virospack's standard range of product finishes. One of the principal benefits of this decoration is that the finish is similar to that of a fingerprint, highlighting the area to press for consumer convenience, and the anti-slip finish makes it perfect for oil-based formulations which can sometimes cause a slippery scare for the user. Virospack's new cosmetic dropper proposal benefits greater visibility through its design and greater formula in-take than standard, 0.8ml dosage. It is ideal for cosmetics that require a larger dosage application or a more extensive treatment area (such as for hair treatments, body cosmetics, or cosmetic treatments for men…). DESIGN. Virospack's new cosmetic dropper is different, combining innovation with subtlety through its special curved shape with fingerprint texture decoration. FUNCTIONALITY. The curvature of the bulb facilitates the in-take of 0.8ml formula, a higher volume than most droppers. Ideal for products over a larger treatment area of that require more product. ERGONOMICS. The bulb's curvature indicates the pressure zone. CUSTOMIZATION. The new silhouette bulb with textured finish can be coloured according to brand requirements, as well as metalized. It's compatible with a large range of Virospack's standard caps which fit a multitude of vials on the market. This new reference in Virospack's product offering increases the wide range of standards offered by the company, expanding personalization options available for brands.